« Please Take Your Use Of Passwords Seriously! After several days of using Mazda Connect, I am going to declare that this infotainment system has replaced Chrysler’s UConnect system as the easiest to use infotainment system on the market today. If I were Mazda, I would take this system complete with the HMI and use it in everything that they make. I would also promote it to death and get people to use it. They will find it to be simple to use and it works exceptionally well. Kudo’s to Mazda for coming up with this system. A touchscreen that is mounted to the top of the dash as is the case here. This particular screen is 7″ in size. Then there’s the HMI (Human-Machine Interface) Commander Switch behind the shift lever. The controller is surrounded at the front by five buttons: Audio, Home, and Navigation along the top, and Back and Favorites on either side. 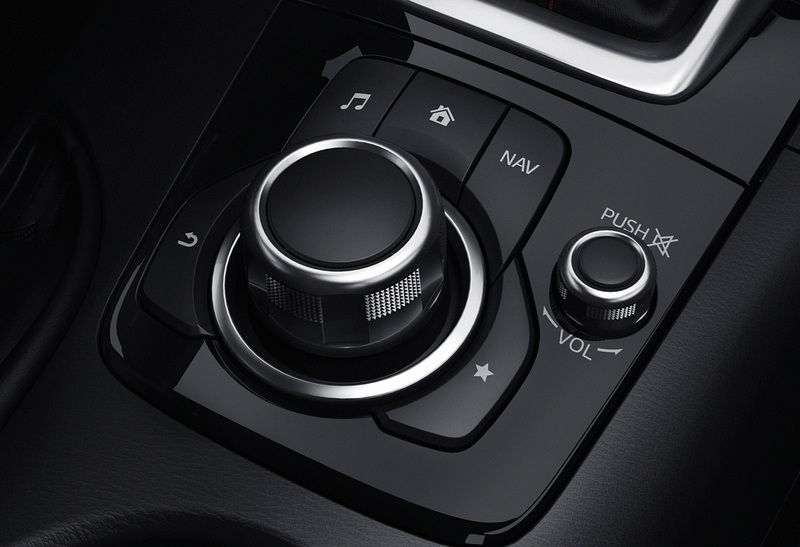 Next to the commander is a rotary volume knob that can also be pushed in to mute the audio system. Applications: When I tested this system in the Mazda3 Sport GS, it had a HD Traffic Map, fuel economy monitor, an app to let you know when to service the car, and another app that gives you guidance on any warnings that the car generates. Other apps can be added to Mazda Connect once they become available. Entertainment: When I tested this system in the Mazda3 Sport GS, it had Aha Radio (which allows you access to Facebook and Twitter), Stitcher Radio along with Pandora. All of these work with apps that are installed on your smartphone to bring you Internet radio to your car. You also get Bluetooth audio as well as the ability to plug in two USB devices such as a pair of iPhones so that you can have lots of music on long drives. Communication: This function allows you to make or receive phone calls, or grab messages from supported phones. This is also where you can pair your phone to the system via Bluetooth and it takes seconds to do. Navigation: This function which is powered by TomTom Nokia HERE will help you get from point A to point B easily. Settings: This will allow you to customize the system to suit your needs. Below each icon are one or more menus that are easy to navigate in a up and down fashion. Plus you can use the HMI as a joystick by pushing the entire knob in whatever direction you need to quickly navigate through sub menus. The net result is that this is a very natural way to navigate a system that could easily be complex and overwhelming for the average user. Besides the HMI Commander switch, you can also use the 7″ touchscreen to do what you need to do as well. However all touch functions are disabled when the car is in motion. That’s a very good safety feature. There’s also voice commands that are quick and easy to learn as well. Anyone I exposed Mazda Connect to was able to figure out how to use it in a minute or two and they never had to open the manual to do so. That highlights how well designed this system is as one of the top frustrations from car owners is how complex infotainment systems can be. Another thing that Mazda gets points for is how smooth and fluid the system is. All the graphics move smoothly and everything is quick whether it be moving between menus or plugging in your iPhone to play tunes. It is clear that Mazda put a lot of time and effort to make sure that every aspect of this system is perfect. Mazda has a winner in the form of Mazda Connect. It’s only available in the Mazda3 as far as I am aware, but one hopes that it will make its way into other Mazda vehicles soon. It’s truly something that will drive sales towards Mazda vehicles when prospective customers try it out. This entry was posted on June 30, 2014 at 7:03 am and is filed under Products with tags Mazda. You can follow any responses to this entry through the RSS 2.0 feed. You can leave a response, or trackback from your own site. I agree with your overall comments about ease of use, and having used several other systems (in-built or windscreen-attached) I think the positioning of the 7″ screen is ideal. Mazda have done significant research on the development of this system and I find it annoying to read comments elsewhere that the screen looks like an after-market add-on – quite the opposite I believe. Your comment about the navigation system in the Mazda Connect (called MZD Connect in some countries) being powered by Tom Tom is, however, incorrect. The mapping is provided by here.com which is an offshoot of Nokia. Actually, the Mazda3 I drove had maps from TomTom. I pulled it up from the copyright screen. I am owner of a Mazda 3 and am a bit disappointed about this system though. It would be nice if the USB1 is available (it is locked) and when MirrorLink would have been added to the MZD connect system, because Mazda navigation is very expensive compared to Tomtom and only 3 years of updates available, it is TMC based and thus not real time. So basically, if you donot have the Mazda navigation, you are stuck with a big screen on your dashboard, for little information and you will need a navigation device because without mirrorlink or usb1 available you cannot use your android for google maps. I have this system in my CX5 and I hate it. Instead of being able to jump right to a radio station you want, you have to use the stupid captains knob or click the button on your steering wheel and scroll through all other stations until you get to the one you’re looking for. It won’t let me select which email address to load so it’s only ever checking my junk email instead of personal or work, and it’s only loaded the contacts from my junk email so I can call my insurance agent but it doesn’t recognize my mom, or my husband as contacts. I’ve also only owned the car since September and it’s deleted everything (contacts, radio stations, all car settings) 4 times. So I get to manually re-input info every 6 weeks or so. Very disappointed, this definitely increases distractions while driving instead of minimizing :(. If you have any suggestions on how to get this thing to work better, I’d love to hear them. Disclosure: This is just a copy-paste from a comment I left on digitaltrends, but I’m utterly shocked at any decent review of this horrific system. 6. Click Radiohead, select album, click on the first track and play. Total time to play a single song: 1-2 minutes. This should take less than a minute. 7. If you want another album, hit the back button and go to step 2. Not step 6, not back to the artist … step 2 … scrolling and scrolling, until you reach the artist and the album. This should take less than 15 seconds, yet it takes the same 1-2 minutes it took just to play a single song in the first place. If this is your definition of “easy to use,” I have to assume you still use sticks and rocks to make fire. Add the dumb navigation system–which is a requirement if you want heated seats on an i model, as most of us do in New England, anyway–and the unintuitive way the whole system turns off if you turn the engine off (which means that if I want to listen uninterrupted to something as I pull in to my destination, I have to leave the car running–compare to VW, BMW, etc., where the sound doesn’t turn off till you open a door or remove a key), and you’ve got a pretty stupid and already-out-of-date system, overall. The screen is clear and the positioning is high putting it close to eyeline, rather than peering down the console. Ideally it should be rotated 5-10 degrees to face the driver. The dual/joystick/button combo is lovely and the adjacent volume dial is very well placed. This is where the system falls down. One cannot reach things quickly, there are submenus to be drilled into. It’s unpleasant to use. A few programmable virtual buttons for common tasks like favourite radio stations, favourite contact and other functions (like screen off) would mean instant results, rather than unpleasant shifting between menus. Having used Garmin satnavs all over Europe moving to the Mazda system was a very poor experience. – Compared with Garmin the user interface is poor and unintuitive. – I cannot load my own points of interest or routes from my computer mapping software. – Putting together a route with many waypoints is possible but much easier on a Garmin. – There is no facility to review journeys by downloading logs to a computer. – it is horrendously expensive. After three years use a map update costs as much as buying a Garmin satnv which includes free map and POI updates for life.